Hawthorne VillageTM makes many kinds of collectible train sets and accessories for them. 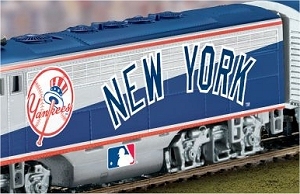 The trains on this page celebrate the colors and spirit of your favorite team. They run like champs. They also look great on a shelf in the "den" or "rec room." 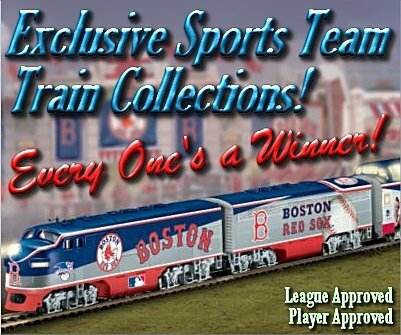 From a collector's, railroader's, railfan's, or baseball fan's point of view, these are exceptional products. I wish we could show every train - the graphics are stunning. Individual train cars are HO scale, completed oval track measures 38" x 58"
Note about Subscription Trains and Gift Sets - All of the trains on this page are available by "subscription." That means that when you order the train, you pay for and get one "issue" at a time. The first issue in the collection is always the powered locomotive, and it's always an exceptional value.About 4 weeks later, you get (and pay for) the second "issue," which usually consists of an unpowered "B Unit" locomotive and a circle of track. About four weeks after that, you get a car, usually a "vista-dome" coach and a Bachmann power supply. About four weeks after that you get another car, usually another coach and more track. You can discontinue your "subscription" at any time, and even return trains you've already got. But most people like the trains so much they keep getting them - and Hawthorne Village is going to keep making them as long as demand stays high. So depending on demand, your train could be anywhere between four and twenty "issues." Because it takes at least the first three issues to run a train, Hawthorne Village has packaged some of the high-demand trains into "Gift Sets," sometimes called "Super Starter Sets." On this page, they're listed below the subscription trains. If you order one of these, you get the first three issues all at once, and then your subscription starts. So you'll get the fourth issue about four weeks later and so on. Note About Team-Inspired Villages - When demand for a particular team's memorabilia is high, Hawthorne Village may issue additional collections inspired by the team. The most common is a "Christmas-village"-style village collection that includes stadiums, other buildings, miniature fans, and other accessories - everything you need to build a "team town" your railroad can serve. Unfortunately, most of the baseball "team villages" are now out of stock. As of February, 2013, the only ones I can find are the Cardinals , Mets , Yankees , White Sox , and Red Sox . But if you order a train, stay on Bradford Exchange long enough to see if there is a village that will go with it. Just remember, these are limited editions, so if you see a village that goes with your train, don't wait too long to decide if you want it. Other Team Trains - Occasionally these include NHL or NCAA teams that have won championships. If you can't find your team, it may still be in stock. Simply click here and do a search on your team name. The products shown below are "Subscription" trains that come one issue at a time, starting with the locomotive, with the next issue coming about four weeks later, and so on. Some of the train collections can also be ordered in "Super Starter Sets" that give you the first three issues. Those are shown below this set of products. If you order the products shown in the following list, you pay for and get the first three "issues" at once: The powered locomotive A Unit, the unpowered locomotive B Unit, one coach (usually a "vista dome"), a circle of track, and a power supply - everything you need to start running the train. Then your "subscription" starts up for "real." About four weeks later, you should get the second coach and more track, then another issue will come every four weeks until you have the whole set. You can cancel any time you want, and even send pieces back you don't like. But most people want the whole set. In fact I get a lot of e-mails from folks who've got the first several pieces, then stopped their orders for some reason, but now they want to know how to get BACK on the subscription list. Yes, I know we don't play baseball in December. But a few years ago, Hawthorne Village tried introducing MLB-themed baseball villages for "die-hard" fans. Most have sold out, but a few remain. If you don't see a village for your team here, click on one of the other villages, then do a search on your screen name when the Bradford Exchange screen comes up. Your team may not have a village. As I said, most of them have sold out. But you might find something else you like just as well. If you can't tell exactly which team is shown in the pictures below, just mouse over the pictures and you should see the name of the team. If you order the products shown in the following list, you pay for and get the first three "issues" at once: The powered locomotive A Unit, the unpowered locomotive B Unit, one coach (usually a "vista dome"), a circle of track, and a power supply - everything you need to start running the train. Then your "subscription" starts up for "real." About four weeks later, you should get the second coach and more track, then another issue will come every four weeks until you have the whole set. You can cancel any time you want, and even send pieces back you don't like. This section will contain other team trains that come up from time to time. Sorry, we have no idea what will become available. Usually NHL, NCAA, and (very rarely) NBA team trains will show up here only if they've won a recent championship or if there's a VERY steady demand. If you see "your" team in this section, you should know that these sets are made in extremely limited runs, so don't assume you'll get one of these if you put it on your Christmas list in April, or even October. This section will contain any NASCAR trains that come up from time to time. At the moment, you'll see what looks like Two Dale Junior trains. If you click on the one on the left, you can get it an "issue" at a time (like a magazine). The first issue is the powered locomotive A unit. About 4 weeks later, you'll receive (and pay for) is an unpowered locomotive B unit and a circle of track. the third issue is a "vista-dome" coach with a power supply. The fourth issue is another coach and more track. You can cancel any time, or return any issues you don't like, but most folks get at least the first four pieces. If you click on the one on the right, you can order (and pay for) the first three issues all at once - enough to run the train on a circle of track. THEN your "subscription" will start. About four weeks after your first shipment, you will receive (and pay for) issue # 4 and so on. You don't have to decide now - click on either picture for details. If we get any MORE NASCAR trains we'll post them here. Note: Family Garden Trains?, Garden Train Store?, Big Christmas Trains?, BIG Indoor Trains?, BIG Train Store?, and Trains-N-Towns? are trademarks of Breakthrough Communications (www.btcomm.com). All information, data, text, and illustrations on this web site are Copyright (c) 1999, 2000, 2001, 2002, 2003, 2004, 2005, 2006, 2007, 2008, 2009, 2010, 2011, 2012, 2013 by Paul D. Race. Reuse or republication without prior written permission is specifically prohibited. Big Christmas Trains(tm) is a participant in the Amazon Services LLC Associates Program, an affiliate advertising program designed to provide a means for sites to earn advertising fees by advertising and linking to amazon.com. readers. Many are designed by Thomas Kinkade and other world-class artists and designers.